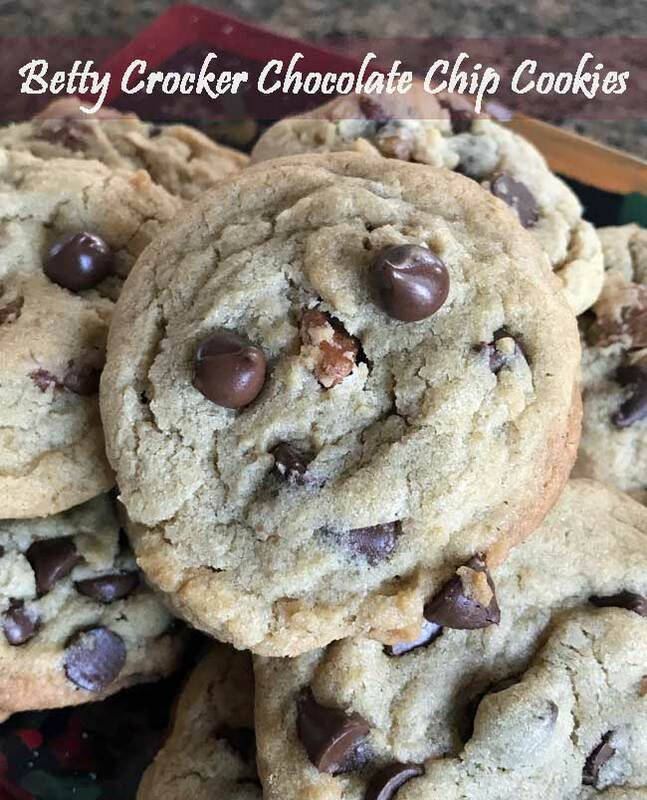 The Betty Crocker Chocolate Chip Cookies from the 1969 Betty Crocker Cookbook are always a hit, which is why I always go back to this recipe year after year. It calls for a mixture of shortening and butter so the cookies don’t spread too much and are fairly thick. Chilling the dough overnight will give you even thicker cookies, as will baking them in a convection oven. I like to make a bunch of dough balls and bake them as needed in my Breville convection toaster oven using the “Cookies” setting. Half batch version of chocolate chip cookies from the 1969 Betty Crocker Cookbook. Beat the shortening and butter until creamy, then add both sugars and beat with an electric mixer until light and creamy. Add the egg and beat until it is blended in, then beat in the vanilla. Add the salt and baking soda and beat until thoroughly mixed, then add the flour and stir until blended. Stir in the chocolate chips. Using a medium size cookie scoop, scoop out balls of cookie dough. Bake immediately or arrange on a foil lined dinner plate, cover with plastic wrap and chill overnight. To bake the cookies, arrange 2 ½ inches apart on a parchment lined baking sheet and bake at 375 for 10-12 minutes (time will vary depending on size of cookie and how cold the dough is). Let cool on baking sheet for about 5 minutes, then carefully transfer to a wire rack. The yield will vary depending on how big you make the cookies. If you make the cookies fairly small you can get over 3 dozen. I like using a medium size cookie scoop. Did you read The Cookie Scoop blog on Tate’s Cookies: http://thecookiescoop.blogspot.com/ for May 15? She bakes her twice to get a similar crunchy cookie. Hi YAA–I use a good dark chocolate chip in my NYT adaptation and that seems to be what people love the most. I never put the salt on top, but I do like using coarse salt in the dough. I’ve been making the NYT cookie for a while now, using far less chocolate, far less salt. I do use the waiting period, because in the interest of science, I baked cookies from the same batch of dough over the course of several days, and I find that I do prefer the flavor of the cookies baked from the older dough. I only use a cup of chips (Guittard milk chocolate, lately), and not much salt. I like being able to get a good taste of the caramel-y base dough, and with tons of chocolate, it gets lost in the shuffle. The NYT cookie is my adapted go-to cookie and I never chill the dough overnight. Sometimes (more for my own convenience) I chill the dough a few hours, but sometimes not at all and the cookies are great every time. Everyone begs me for more of those cookies AND the recipe. I keep the two flours on hand just for those cookies. I’ve had people offer to pay me to make them some of those. Yesterday I made some ccc’s from a recipe at a SLC country club. They are just okay. I’d have rather have made mine. Aw, it’s still fun to try different ones. I bookmarked this, as I’m always on the look-out for a new favorite chocolate chip cookie! Let’s not forget Alton Brown’s “The Chewy” and the UNIX guy, W. Richard Stevens’ “Ultimate Chocolate Chip Cookie”. I always have bread flour on hand, and don’t mind the overnight dough chilling while anticipating a great cc cookie. Darlene, I almost put Lee’s on the list! That’s a good one too. The New York Times cookie is a good one, but not very convenient because it requires two types of flour and the overnight chill. It’s a good cookie, but I rarely have both of the flours on hand and don’t like the waiting period. I like my chocolate chip cookies thick, crispy on the outside, and soft on the inside, but I can never make them.. Whenever I make them they end up harder and my family likes them that way. I didn’t know 5/15/11 was national ccc day. I will need to try one of these! It seems the more brown sugar to white sugar makes them softer….. The recipe you posted almost 2 years ago (Lee’s Chocolate Chip Cookie) from Boston pastry chef Lee Napoli is a favorite of everyone who tries it . Maybe its the melted butter, 3 types of sugar, and extra egg yolk that makes it so special. Now that I’m reminded how delicious they are, I think I’ll have to whip up a batch to celebrate Chocolate Chip Cookie Day. i forgot that you had a Tate’s recipe up here. it’s literally been ages since i’ve made a crispy cookie. did you try those browned butter cc cookies from test kitchen? those are next on my list. i’m sure you did already, i mean this is cookie madness after all. When I’m in the mood for crunchy cookies, I like Cindy’s version better. The FC ones are really good, but the shortening (and lack of milk) makes for a crispier, crunchier cookie. The FC cookie is definitely a good one, though. Mmmmm chocolate chip brownies cookies are so good! Just bought some of the Nestle’s dark chocolate chips and have to decide whether to make my usual (very flattered they’re still on your list, thanks!) or try one of the others. Very hard decision! Anna, I just looked at the CindyD cookies. The ingredients are like Frog Commissary Oatmeal CC Walnut Cookies, except FC uses softened unsalted butter, 2 T milk, 1 tsp salt, 2 1/2 c old-fashioned oats(not instant), and 1 1/2 cups walnuts. The chips can be doubled. These are initially soft and chewy, but the next day are hard and crunchy, depending on your preference. And, for fat cookies, you chill the dough overnight. These were really popular cookies at FC, a popular Philly restaurant 25 years ago.